FIFA U-20 WWC: Ajibade loses goal against China – Royal Times of Nigeria. 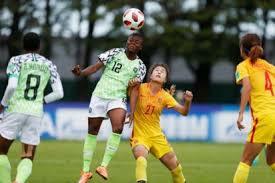 Rasheedat Ajibade who was credited to have scored a last gasp equaliser against China in their group D game of the Under-twenty Women’s World Cup France 2018, has lost the right to own the back-breaking goal. FIFA ruled that it was an own goal knocked in by Chinese right-back Jiaxing Dou. Ajibade now has only one goal to her name in the tournament. However, the goal will remain in the memory of the Falconets players as they faced an early exit, until substitute Aishat Bello drilled in a telling cross which was deflected into the net. Bello’s efforts proved decisive, as the 17-year-old got in behind the Chinese backline on the right before playing in a well-driven cross towards Ajibade. The Nigeria captain’s challenge for the ball prompted the deflection off of Dou for an own goal.